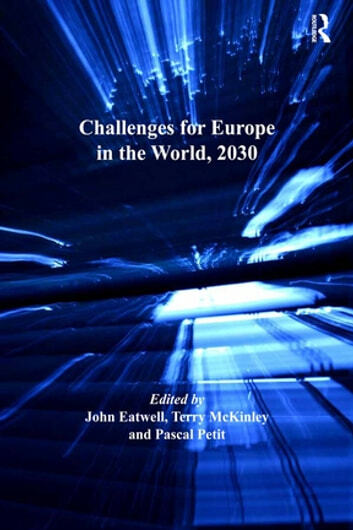 Challenges for Europe in the World, 2030 embodies critical thinking about the long-term implications for Europe of the clear shift of power from the West to the East and the South. Designed as a multi-faceted project, this book presents an integrated assessment covering a wide range of policy areas and alternative assumptions about trends in global and European governance. In order to reach this ambitious objective in a comprehensive and consistent way, several types of quantitative and qualitative approaches have been combined: a model of macro regions of the world economy, an institutional perspective, and lessons from foresight studies. With a strong focus on policy implications, the book is introduced by an executive summary which outlines the project assumptions, especially on the future of Europe in the context of the current economic crisis and of the emergence of a new balance of powers in the global economy. Subsequent chapters cover the regulation of finance, trade and technology developments, environmental sustainability, employment conditions and population wellbeing. The book concludes with an assessment of the extent to which these developments are likely to lead to significant political changes in Europe. In sum this book challenges public policy makers to re-assess their thinking in shaping Europe’s future.